Glimmerhold is a prosperous dwarven city, a hub for caravans and known for its quality smithing. But inside this bastion of trade and wealth lies a dark secret, something that makes the common folk nervous and the decadent nobles speak in harsh whispers about things best left forgotten. Now supernatural forces batter the city, and an abandoned dwarven monastery may hold the key to the city's salvation - or its complete destruction. Can the PCs stop these old betrayals from shattering the walls of Glimmerhold? Or will the sins of the past bring an end to the city? 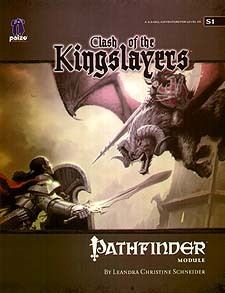 Clash of the Kingslayers is a city and dungeon adventure for 10th-level characters, compatible with the 3.5 edition of the world's most popular roleplaying game. Within its pages, you'll find an introduction to the magnificent tower city of Glimmerhold, a detailed overview of a haunted dwarven ruin, a vengeful walking dungeon, and gluttonous supernatural monsters from the dawn of the world. This adventure takes place in a self-sufficient dwarven city in the Pathfinder Chronicles campaign setting, but can easily be set in any game world. This module is the result of Paizo Publishing's RPG Superstar contest, which allows unpublished authors to compete before a panel of celebrity game designers and legions of their peers for the chance to write a Pathfinder adventure.